Preheat oven to 375 degrees F (190 degrees C). On a lightly floured surface, roll out one crust, and place in a 9 inch pie plate. Roll out top crust, and set aside. In a large bowl, mix together the sugar, tapioca, and cinnamon. Add blackberries and apple slices. Toss gently to coat without mashing the berries. Let stand for 20 minutes. Spoon filling into pastry lined pan. Dot with butter. Moisten the edge of the pastry with water. Cover with top crust; trim and crimp edge. Cut a few slits in the top to allow steam to escape during baking. Cover edge with foil to prevent over-browning. Bake in preheated oven for 25 minutes. Remove foil, and continue baking for 20 to 25 minutes, or until crust is golden brown. Cool on wire rack. Excellent! 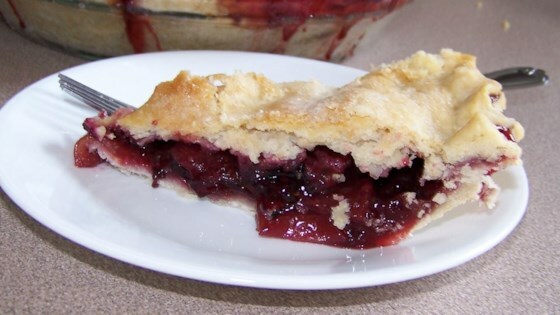 After making a Blackberry pie, I had a couple of cups of berries left over and tried this recipe, it was way better than the blackberry-only pie-perfect texture and very delicious!! Absolutely delicious!! Wonderful to find a pie recipe using blackberries! Everyone gobbled this pie up in no time! yum!! !